Two plane parts found in Mozambique almost certainly came from missing Malaysian Airlines flight MH370, the transport ministers of Australia and Malaysia say. The two parts were found separately by members of the public and were flown to Australia for analysis. Australia’s Darren Chester said the finds were “consistent with drift modeling” of ocean currents. The plane went out of contact while flying from Kuala Lumpur to Beijing. Satellite data suggests it likely went down in the southern Indian Ocean after veering off course for unknown reasons. The fate of the plane, its passengers and crew remains one of aviation’s biggest unsolved mysteries. One of the parts retrieved in Mozambique was found on a sandbank by an amateur US investigator in late February. That find prompted a South African tourist to come forward with a piece he found in Mozambique in December. 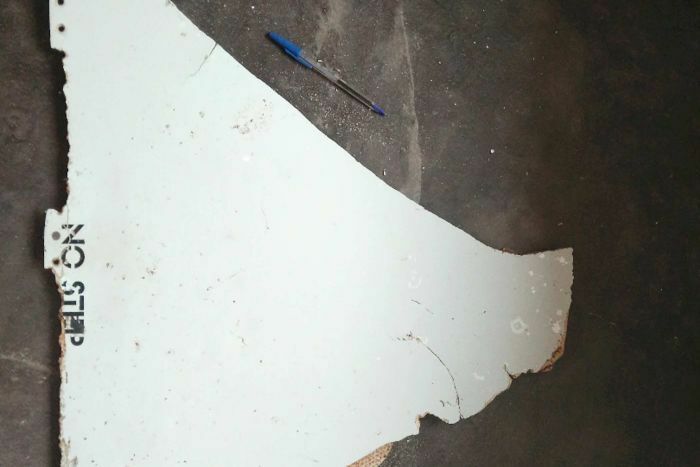 Darren Chester said the investigation team had finished examining the debris and found both were “consistent with panels from a Malaysia Airlines Boeing 777 aircraft”, the same make as the missing plane. “The analysis has concluded the debris is almost certainly from MH370,” he said in a statement, adding that it showed that the vast deep-sea search for the plane in the southern Indian Ocean, being led by Australia, was focusing on the right place. Malaysia’s Transport Minister Liow Tiong Lai later told a news conference that paint samples from the debris indicated they were parts of the missing plane. “First, the two pieces of debris belong to Boeing 777 parts. Secondly, from the paint and the stencils of these two pieces, it is similar to MAS [Malaysian Airlines] airlines paint. We conclude it is most certain [it] belongs to MH370,” he said. The Australia-led search is scanning the sea floor, much of it previously unmapped, in the hope of locating the wreckage. Darren Chester said that would continue for now, with 10,000 sq miles of ocean still be to covered. However, the three countries have said that barring significant new evidence, they will end the operation once the area has been fully searched. The MH370 search is expected to be completed in the coming months. Meanwhile, officials are arranging to collect and examine a fourth piece of debris, found at Mossel Bay in South Africa’s southern coast on March 21 by a local archaeologist. The piece apparently bears a part of the logo of Rolls Royce, the British company which manufactures engines for aircraft including the Boeing 777. Malaysia says it is awaiting permission from South Africa to conduct a search of its coast for more debris.